Rookie defensive end Rasheem Green wasn't fazed by his first career start. The real test would come later. The environment was eating him alive. Ironically, that wasn’t a problem during the Seahawks’ preseason-opening 19-17 loss to the Indianapolis Colts on Thursday, when Green started his first career game in front of 68,418 fans at CenturyLink Field. But afterwards, sitting at his locker, surrounded by a semicircle of reporters with television cameras and digital recorders, his eyes wandered to his left, and he couldn’t help but smile. There was fellow Seahawk defensive lineman Nazair Jones, a massive man in the crowd, sticking out a bottle of water to act like a mock microphone. And behind him, there was defensive end Frank Clark, pumping out jumping jacks while wearing a goofy grin. Green certainly seemed relaxed on Thursday, when the rookie from USC finished with seven tackles and 1.5 sacks. The first sack of his professional career came on the Colts’ second drive, when Green dipped around the edge, slipped past left tackle Joe Haeg and upended quarterback Andrew Luck. The Seahawks are counting on more cool feelings from Green in the weeks to come. That’s especially true considering that Dion Jordan, the team’s preferred starter at Green’s position, continues to nurse a stress reaction in his shin, with a return for the regular season opener on Sept. 9 looking more and more unlikely. 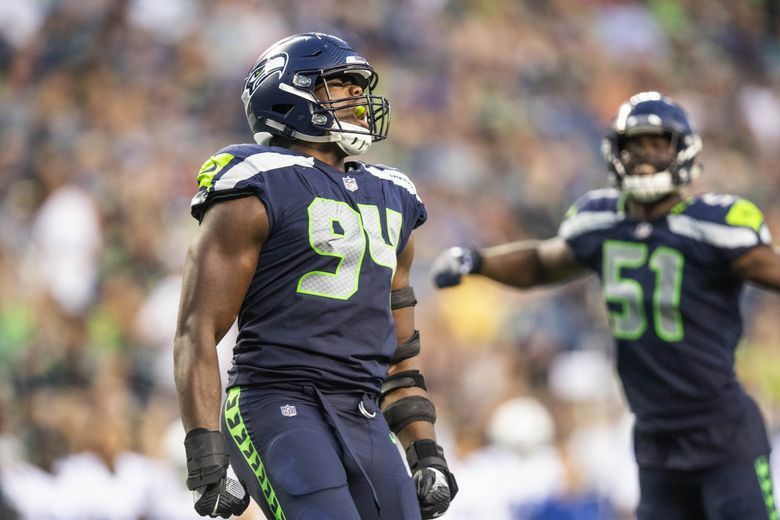 Combine that with Frank Clark’s offseason hand surgery, and the Seahawks’ pass rush — at least, for now — sits in a precarious position, dependent on the performances of rookies like Green and Jacob Martin. But they still don’t have to do it alone. “I feel like there shouldn’t be any doubt that we’ll have a pass rush this season,” Green said, “because the guys in this room — with Jarran Reed, Frank Clark, Naz (Jones), (Branden Jackson) — I feel like those guys are great d-linemen who can step in and do the same things. Green — all 6-foot-4, 279 pounds of him — certainly shares that potential, a year after he closed his USC career with 10 sacks and 12.5 tackles for loss. But even in southern California, he didn’t garner this kind of spotlight. More sacks bring more “cool feelings,” which bring more interviews, which bring more jumping jacks. And while Green may be easily distracted in the locker room, on the field he’s anything but. “If I’m being honest, when I first got drafted I didn’t think, Week 1, I’d be starting,” Green admitted. “But at the same time I’m trying to go out there and start. I’m not trying to go out there and be a backup or anything. Joey Ivie signed, then scored. Last week, the former Florida Gator defensive tackle embarked on a tour of tryouts, from the New York Jets to Cincinnati, finally to Seattle. He officially signed with the Seahawks on Sunday. “I was (thrust) right into practice, so I had to learn the install for this week,” Ivie said on Thursday night. “We had to go over a lot of film of what we thought the Colts might run or do. So it was a lot, but as a professional athlete you’ve just got to prepare and give it your all. “It’s definitely pretty cool to come in and be able to do all of this in four days. Specifically, Ivie made two tackles on Thursday, but it was a near 30-yard sprint that provided a surprising payoff. With 3:24 left in the game, a shotgun snap to quarterback Brad Kaaya went awry, sending players running after the football in a mad scramble. It bounced unpredictably, traveling 29 unusual yards before Ivie finally fell on it in the end zone. It was the 6-3, 295-pound defensive tackle’s first touchdown since high school. Not bad for a four-day vet. Rookie linebacker Shaquem Griffin finished with a team-high nine tackles on Thursday. And he credited that performance, in part, to the constant presence of veteran linebackers Bobby Wagner and K.J. Wright. But what about twin brother Shaquill Griffin, a second-year Seahawks cornerback? With him, it’s less advice and more orders. “You’ve got 15 seconds,” Shaquill jokingly announced, effectively ending the interview. The Griffins, after all, had to catch an Uber home. Starting quarterback Russell Wilson was unsurprisingly complimentary of second-year running back Chris Carson, who carried four times for 26 yards on Thursday while returning from a broken leg. “I was able to talk to Chris before the game, when we were doing some hand offs and stuff,” said Wilson, who was 4-5 for 43 yards and a touchdown in his only drive of the night. “I looked at him and told him, ‘Remember all the things you went through this past year just to get ready for this moment and be great.’ That’s what he is. That’s who he is. He’s been phenomenal all offseason. He has a great mindset. Of the six running backs on the Seahawks’ roster, Mike Davis is the oldest. And he’s 25 years old. “I was looking at the screen and it was J.D. McKissic on the kickoff return,” Wilson said. “I was thinking about how J.D. McKissic is only in his third year and how good of a football player he is. He could be a star. Think about a guy like that.